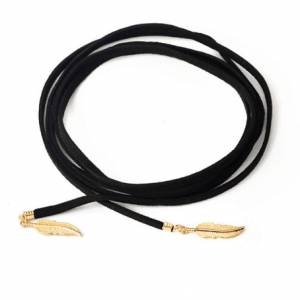 Give your outfit a cool touch with the choker necklaces from Aphrodite. The choker necklaces are avaible in the colors silver, gold, black, red and brown. 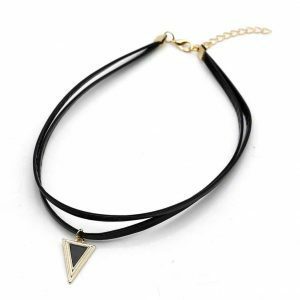 You will fall in love with this choker necklace! This black choker necklace is made of lace. It ensures that your outfit gets a chic touch. Mix and match it with minimalist necklaces for a low effect. 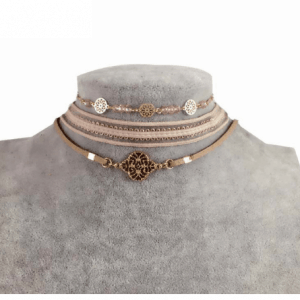 You can wear this lace choker necklace with both silver and gold jewelry. Make your look with a bracelet of a subtle bracelet. Do you have questions about the black lace choker necklace? Send us a message. “Even the smallest star shines in the darkness” This choker necklace has a small black star pendant. 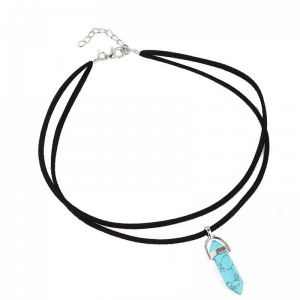 Combine this cool choker necklace with minimalistic necklaces for a low effect. Finish your look with gold jewelry. Example with nice star studs earrings with a subtle bracelet. Create your own neck candy! ???? Do you have questions about the choker necklace with black star pendant? Send us a message. 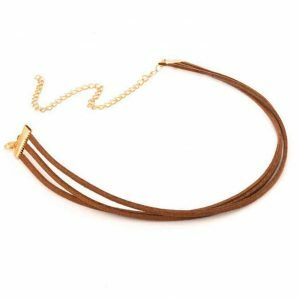 The timeless wrap choker is the perfect addition to your outfit, especially if you throw on a simple look. 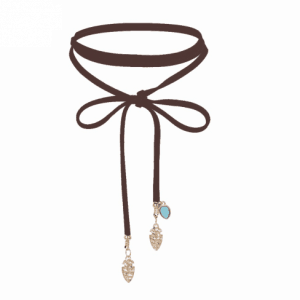 The choker can make your outfit look more complete and interesting without being tacky. This is definitely a piece that will be worn in the next seasons, which means that you will always have something in your wardrobe that will catch people’s attention. Rejoice! The 90s trend is here to stay! The choker trend isn’t going anywhere, and we’re very happy about that. 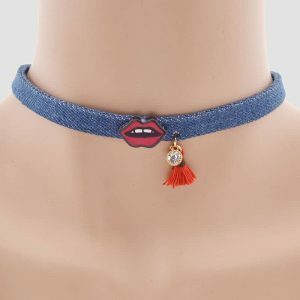 Keep your collection of velvet chokers, rhinestone chokers and classic pendant chokers up-to-date with our extensive range of fashionable choker necklaces you’re sure to wear over and over again. A choker necklace is a must-have piece of jewelry that should certainly not be missing in your jewelry collection. The black necklace is worn tight around the neck. We have different types of chokers in our collection. 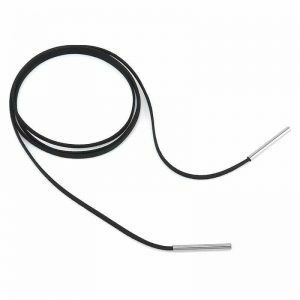 Chokers with wide and thin bands that are made of velvet. 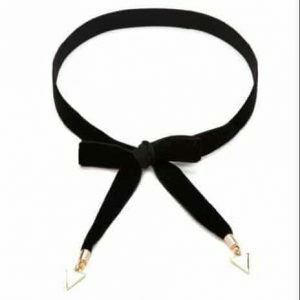 You can think of the popular velvet and tattoo choker. 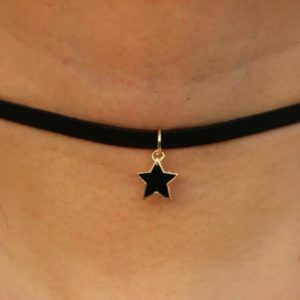 Choker necklaces with nice pendants such as coins and stars. But also for example with a cute heart, moon or shell. You can buy chokers from us in different colors such as black, white and brown. But also pink, blue and purple. The choker with flowers is especially nice for the summer! You can wear the choker necklace together with a double necklace for a layered effect. 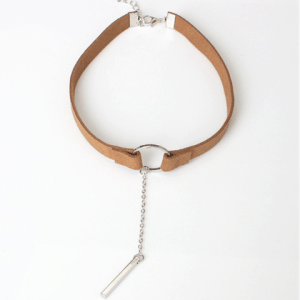 Are you a woman who loves minimalist jewelry? 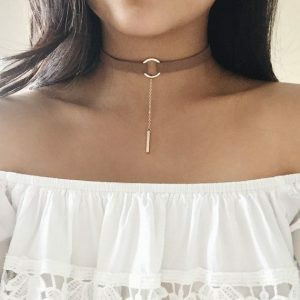 then the minimalist choker necklace is perfect for you! You can wear this beautiful piece of jewelry to school or to a night out. It is the perfect accessory for a cool look or when your outfit needs an upgrade. The most popular color with choker necklaces is the color black. That is not surprising, because the color black goes well with all colors. You can wear the black choker necklace with an all black outfit. But it also fits well with a red or dark green outfit. 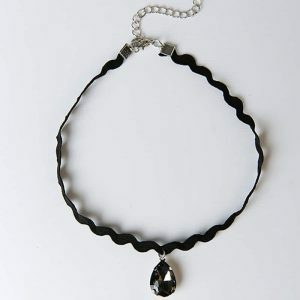 A black choker necklace is a basic piece of jewelry that should not be missing in your jewelry collection. It also ensures that your outfit gets a tough one anyway. 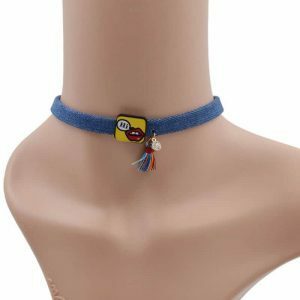 The choker necklace is indispensable from the fashion scene. It is a trendy accessory that ensures that every outfit gets an upgrade. The great thing is that you can wear it every season. The black necklace with charms will brighten up your outfit. The cool black necklace was especially popular in the 90’s but the trend is back. 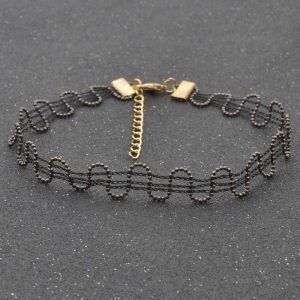 You may also remember the tattoo choker from the past, which is back. You can wear the tattoo necklace with the tattoo bracelet. With this beauty you attract all attention to your face. 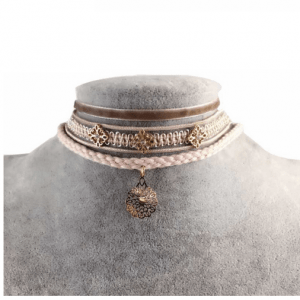 Combine your new choker necklace with other nice jewelry from Aphrodite. For example with a subtle necklace. You can easily make your own layered necklace with a subtile, delicate necklace. Or, for example, wear the golden chain choker necklace with a minimalist necklace. You can wear 2, 3, or 4 chain chokers together. You can always wear the choker necklace to a party, festival, school or work. A must-have accessory that should not be missing in your jewelry box. This beautiful piece of jewelry comes into its own with an open shoulder blouse. That’s how it stands out! Do you also love nice bracelets? 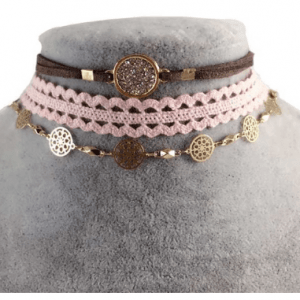 wear your choker necklace together with the beautiful bracelets from Aphrodite. We have several nice fine bracelets that you can wear together or next to your watch. Also have a look at our category bracelets set, we have several nice bracelets sets with which you can make an arm party yourself. Or wear your choker necklace together with the fun earrings from Aphrodite. We have a large collection of beautiful earrings. For the statement enthusiast we have statement earrings. Do you prefer jewelry that doesn’t stand out too much? then you are at the right place! we also have minimalist earrings.